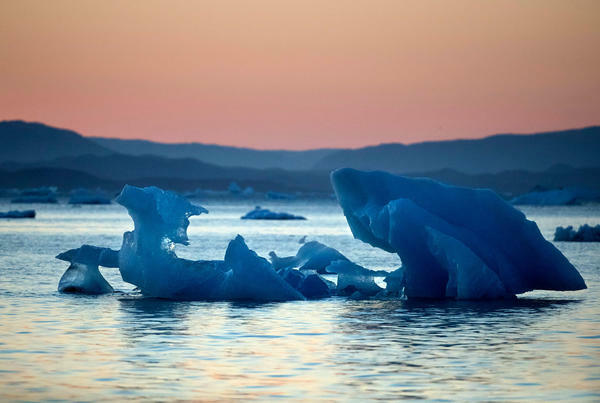 The suns sets as an iceberg floats in the Nuup Kangerlua Fjord near Nuuk in southwestern Greenland, where glaciers have been melting. The world's oceans are rising up about eight inches on average over the past century. The seas are rising more in some places than others. As NPR's Christopher Joyce reports, scientists are beginning to predict where the rise will be most severe. CHRISTOPHER JOYCE, BYLINE: A warming climate is melting a lot of glaciers and ice sheets on land. That's more water rolling down into the oceans. But the oceans are not like a bathtub. The water doesn't rise uniformly. To understand why, think of the Earth as a spinning top with a bit of a wobble. Eric Larour, who studies the planet's frozen regions, says that when huge ice sheets - some 2 miles thick - start to melt, it affects the Earth's rotation. ERIC LAROUR: What happens when you change the mass of the ice, the modification itself makes the wobble change. And this in turn changes the shape of the ocean on the Earth. JOYCE: When the wobble shifts, the oceans shift as if you were shaking a mound of grandma's Jell-O dessert on the Thanksgiving table. That's part of the story, but something else happens, too. Many ice sheets and glaciers are so massive they exert a significant gravitational field, almost as if they were small versions of the moon. The force is tiny, but it does attract nearby ocean water. LAROUR: So what happens when the ice melts is that there is less of it. And so the ocean recedes away from the mass of ice. JOYCE: Larour's team at NASA's Jet Propulsion Lab has mapped how changes in these giant ice fields influence sea levels both nearby and thousands of miles away. They published their results in the journal Science Advances. For example, the ocean along Norway's coast could actually drop a tiny bit if nearby ice sheets in eastern Greenland melt. Meanwhile, those Greenland ice sheets could raise sea levels by inches on the other side of the planet in places like Tokyo. Larour says this is useful information. LAROUR: Out of all the masses of ice around the Earth - Alaska glaciers, Greenland, Antarctica, Patagonia, Himalaya - which ones are going to be contributing to sea level in New York? JOYCE: It turns out that in New York City, the sea level would be affected more by melting ice on the northern end of Greenland than from ice in Canada. Scientists are now using this information to predict the future for American cities. But they're also building in a lot of local geographical information. Oceanographer William Sweet is one of them. He has a personal interest. He lives along the Chesapeake Bay. WILLIAM SWEET: Right here on the Severn River we are somewhere very likely to experience 25 to 50 percent more than the global average. JOYCE: Sweet's at the National Oceanic and Atmospheric Administration. He says NOAA is putting together a sea level rise grid for the country. SWEET: So it really matters when you go to start planning on, I'm going to be prepared for 1 meter of sea level rise. Well, you might really want to be prepared for 4 to 5 feet. One thing's for certain. Once you wait until you realize you have a problem, it's going to be chronic rather quickly. JOYCE: Already, scores of coastal cities are flooding much more often than they used to. As the climate warms, that kind of flooding could become the norm. Christopher Joyce, NPR News.